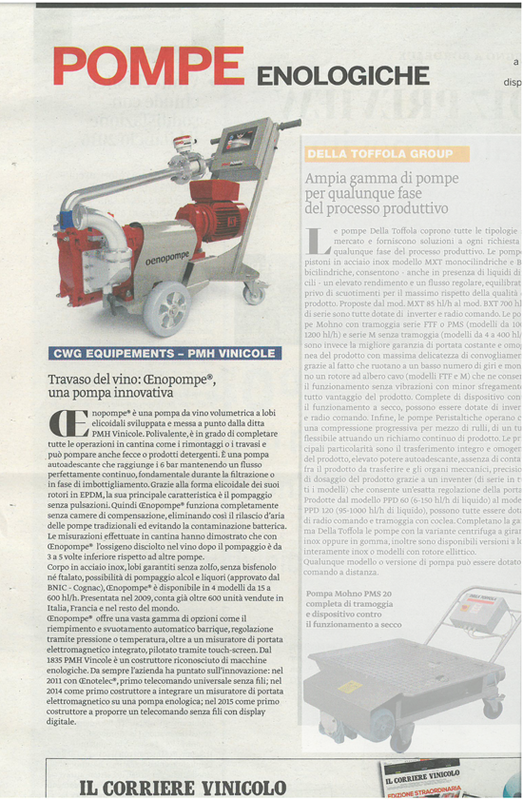 The Oenopompe is a helical lobe volumetric wine pump developed by PMH Vinicole. Multifunctional, this pump is capable of performing all operations in cellars as well as transfer or racking and can pump lees or washing liquids. It is a self-priming pump that operates up to 6 bar to maintain a perfectly continuous flow, especially during filtration or in the bottling phase. Due to the helical shape of its EPDM* rotors, its main advantage is its pulsating pumping. There are therefore no anti-pulsatory bells on the Oenopompe, which eliminates the release of air from traditional pumps and avoids bacterial contamination. Cellar measurements have shown that with Oenopompe, the oxygen dissolved in the wine after pumping is 3 to 5 times lower than with another pump because the smooth flow is continuous. Stainless steel body, lobes guaranteed without sulfur, without bisphenols or phthalates, pumping alcohol and spirits (approved in 2016 by the BNIC in Cognac), in compliance with EC regulations, the Oenopompe is proposed in 4 models 1,500 l/h to 60,000 l/h. Launched in 2009, the Oenopompe has more than 600 units sold in Italy, France and around the world. It offers an large range of options such as racking and automatic barrel filing, regulation by pressure or by temperature , or an onboard electromagnetic flowmeter. 2011: Oenotelec, the world’s first wireless universal remote control. 2014: 1st manufacturer to equip a flowmeter on a wine pumping group, controlled by software via a touch screen. 2015: 1st manufacturer to propose a remote control wireless digital display for a wine pump.